Home to the oldest continuously owned and operated winery in the U.S.
It’s surprising to note that the oldest continuously owned and operated winery in the country is not in the more well-known California wine regions, but in Missouri. That winery is Adam Puchta Winery in Hermann and it is one of more than 120 wineries in the state. In 1984, the Missouri Wine and Grape Board was established to support the wineries, which is now a billion-dollar business. Eight distinct trails link these vineyards. You can learn more about the wines of Missouri, from their official website. The Augusta Wine Trail in Missouri was designated as the “First United States Wine District” in 1980 since wines were produced here prior to the Civil War. Ten wineries make up this trail. They are all family owned and open all year round. Click here for more about the Augusta Wine Trail. Adam Puchta Winery, which was established in 1855, is one of the seven family-owned wineries in the scenic region of Hermann, Missouri, which is known for its food and wine events. 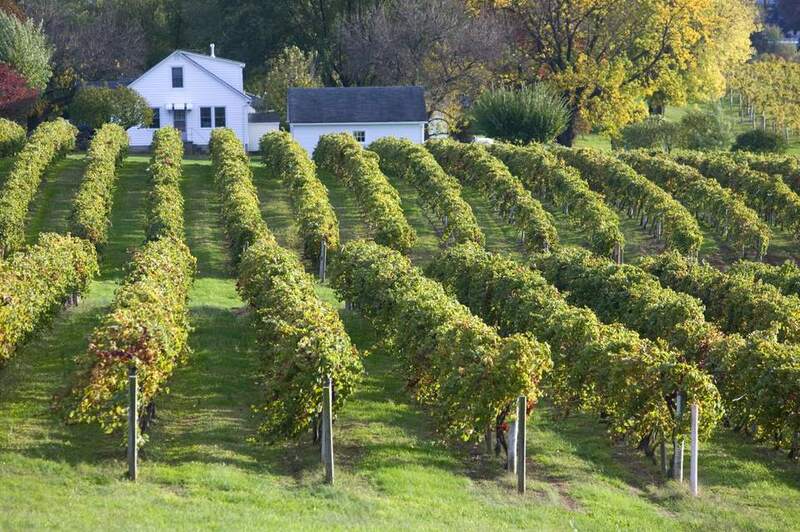 This site will tell you more about the Hermann Wine Trail. It also has a calendar of events. Nine wineries make of the Kansas City Wine Trail, which runs from Kansas City to Waverly in Missouri. The trail goes in a loop so it’s easy to complete in a day trip or during a weekend getaway. You can find all the wineries on the Kansas City Wine Trail on this map. The hills of Southeast Missouri produce a selection of wines on the Mississippi River Hills Wine Trail, which is Missouri’s newest wine trail. This region extends across 40 miles, but only includes five wineries. Visit this link to see the exact locations of the wineries on the Mississippi River Hills Wine Trail. Along the Missouri River you’ll find six wineries producing award-winning wine and food, all close enough to explore in a Missouri day trip. Learn more about the wineries on the Missouri Rivers Wine Trail here. The Northwest Missouri Wine Trail runs just north of Kansas City, Missouri. The eight wineries include some unique sites, as well as some farms that also produce wine. This map will show you the locations of the wineries on the Northwest Missouri Wine Trail. The Ozark Mountains make for an unusual setting for Missouri vineyards. The eight wineries are spread out in seven different towns throughout the region. You’ll find a variety of grapes, fruit wines, and Mead, made from honey, on the Ozark Mountain Wine Trail. Learn more about the Ozark Mountain Wine Trail at this website. The Ste. Genevieve Wine Trail, also known as Route du Vin (wine road), is in Southeast Missouri. This area is filled with rolling hills and known for its colorful fall trees. Read more about the Ste. Genevieve Wine Trail here.